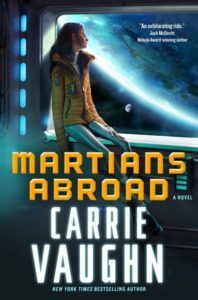 I’m a fan of Carrie Vaughn, and I enjoyed her latest book Martians Abroad (see my review here) which came out in January. 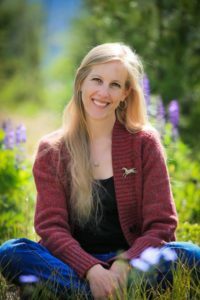 I was thrilled when Tor Books offered me a chance to interview her and give away a copy of Martians Abroad! I hope you enjoy this interview – I was pretty excited to discover that Carrie is as much of a Vorkosigan fan as I am. Hi Carrie! Thanks for taking the time to answer some questions. I haven’t read your Kitty Norville series, but I’ve read your Golden Age books as well as Discord’s Apple, and they’re pretty different from each other. And Martians Abroad is a completely new direction, too. Could you tell us a little bit about what made you decide to write that particular story? I’m inspired by lots of different ideas, and they take me to some pretty far-out places. Martians Abroad came from thinking back to some of the old-school science fiction books my mother gave me to read when I was a kid — books that she had read as a kid in the early 60’s. I wanted to write that kind of story — an optimistic, maybe even idealistic, futuristic space adventure, but one that takes into account all the recent research, discoveries, and technological advances of the last couple of decades. We know so much more about Mars now than we did even ten years ago. I also wanted a teen girl to be the main character and hero of the story. So I folded all that into my own version of this kind of story. Will there be any more stories featuring Polly and Charles? I enjoyed Martians Abroad, but I thought it ended right as Polly was coming into her own. I really want to read more about her. And Charles is a mystery that I desperately want unraveled! That’s great to hear! I do have more ideas for Polly and Charles, but right now I have deadlines for other projects that I’m going to have to work on first. But never say never — I’ll just have to see what happens. I was impressed with how well you portrayed Polly’s reaction to Earth as someone who has grown up on Mars – not just the physical adjustment, but her reactions to minor details. What kind of research (if any) did you do to get that right? Part of it is just looking at Earth through new eyes — think about what it might be like to grow up in an environmentally sealed colony situation, and then find ones self on a big wide planet. Reading up on what life is like on the ISS is helpful for that, as is reading about how other SF writers handle the situation. I also drew on some of my own experiences of moving around a lot as a kid, and not always feeling at home — my father was military, and every couple of years we lived in a brand-new region. Some of it is extrapolating those experiences to the science fictional situation. I read in your Reddit AMA that you like writing stories about girls having adventures without acquiring a boyfriend by the end. I love this about your work! What made you have that mission? I was something of a late bloomer — I went through high school not really interested in dating and not understanding what all the excitement was about. (My second year of college — that’s when it all hit with a vengeance.) I’m absolutely certain there are a lot of teenage girls out there who were like me — not yet interested in dating, making lots of other plans for what they want to do with their lives, and frustrated at how inundated we get with messaging about romance and dating and all the rest, as if it’s the only thing we can do. I’m writing about the kind of girl I was, and for girls who might be like that too. When you are writing a story, do you avoid similar books so that you don’t end up copying, or do you seek them out for maximum inspiration? A little of both? I do like to see how other authors handle similar problems — I have a few favorite stand-bys I go to. For space stories, that’s Lois McMaster Bujold and C.J. Cherryh. But I also read as widely as I can because I’m always looking to learn new things about writing, and to encounter something I’m not at all expecting. What parts of writing do you find the easiest/hardest and most fun/tedious? The most fun is probably right at the start, the brainstorming, the first chapters when I start zeroing in on the main characters and the voice of the story, when the ideas are fast and furious and I’m still working to tie them all together. The hardest may be at the end, when I need to revise, take all those pieces and make sure they make sense, when I’m on the second or third draft and still finding changes and improvements that require reworking the entire thing yet again. And then copy editing, and proofreading — by that time I’ve read the whole thing maybe a dozen times and I’m super tired of it but I have to pay just as much attention to make sure it all hangs together. At that point I have to remember how much fun it was at the start, to motivate me to keep going. If you could go back and edit or re-do a particular scene in something that you’ve already published, what would you change? I actually try not to think about this question too much, because if I did, I’m afraid I’d want to change everything and that would drive me insane. Which character that you have created ended up surprising you the most because of the decisions they made? I’d have to say Kitty, not necessarily for anything she did — she was a very vivid character for me and pretty much everything she did made sense to me. But it was exactly that vividness that was surprising. I’d heard writers talk about channeling their characters, but Kitty was the first time that happened for me, and it was a wonderful feeling. That’s a big question! I’m always trying to stretch myself — I’m currently trying to learn about writing mysteries, since that’s a genre I haven’t had much experience with. I’m always trying to write better, and figuring out what that means. I try to give myself a challenge with every writing project, to try to do something new and better. And continuing to make a living at writing without letting the rough parts of the business get me down too much. What writer would you most wish to hear has always wanted to meet you? I don’t know! That’s also kind of a scary question! My favorite writer is Robin McKinley, and I would love to meet her, especially if she also wants to meet me. But if Ursula Le Guin wants to meet me I’ll get on in airplane right now to make that happen. What was it like, to see for the first time a book with your name on the side, sitting on a shelf in between other books? Surreal? Like, I’d dreamed of it for so long, it was hard to take in, the first time. I used to go into book stores and look at that spot between Varley and Verne and just dream, so finally seeing it took a while to sink in. If you had to go on a date with one deity from any mythology (terrestrial or otherwise), who would it be, where would you go, and what are the chances that the date would end in pillow talk? I’ve always felt I was a Tolkienian Elf in a past life. As a teen, The Silmarillion was my favorite because it was mostly Elves and no Hobbits. If you could have Polly team up with a fictional character from another universe, who would it be and why? Oh man. Cordelia Naismith Vorkosigan? Polly could learn a lot from Cordelia, and Cordelia might actually be able to harness some of Polly’s manic energy. Nope! This has been fun, thank you! Thank you for your time again! And thanks to /r/Fantasy for coming up with some of these questions! To enter, please email me at kriti@justaworldaway.com with subject “Martians Abroad” and your name and mailing address (US/Canada only). This giveaway is open until Feb 15, 2017. Edited to add: I will not be using your email address or mailing address for any purpose other than this specific giveaway. If you win, your mailing address will be forwarded to the book’s publisher (Tor Books, in this case) so that they can mail you a copy, but they won’t ever see your email address. Are you going to use the mailing address for anything except this giveaway? I won’t be using the information you send me for any purpose except this giveaway – that applies to both your email and mailing addresses. If you win, I’ll forward your name and mailing address to the publisher (Tor Books in this case) for them to mail you the book. They won’t ever see your email address. I’ve updated the post with this information, too. Thanks for bringing it up! Yep. I got burnt really badly early this year with a giveaway and have been spammed with author marketing emails. It’s been awful. And because it’s all different authors, I have to unsubscribe from each one separately. It’s finally settling down. I was getting several a day. Now I’m down to one every few days.